Impressed with user interface and features of Windows 7 shown during presentation in PDC 2008? Unfortunately for early birds who download and install Windows 7 build version 6801 M3 (6.1.6801), the advanced and new features in Windows 7 has been locked and disabled in that particular build. As such, users only get to use Windows 7 that starkly similar to Windows Vista, without highly anticipated features such as new Superbar enhanced Taskbar, Aero Shake, Aero Peek, Aero Snap (hack to enable Aero Snap in Windows XP and Vista), Desktop Slideshow auto background change and etc. There is some old saying that means if you want to hide it, don’t do it. The fact that the Windows 7 build 6801 already include the new features of Windows 7, but Microsoft decided to lock, restrict and prevent it from been seen allows hacker at withinwindows.com to unlock and re-enable the locked and hidden features. Microsoft protects the flashy features of Windows 7 with elaborate set of checks tied to various shell-related components, which requires users to meet several criteria, including be a member of an allowed domain consists of wingroup.windeploy.ntdev.microsoft.com, ntdev.corp.microsoft.com and redmond.corp.microsoft.com, and must not be an employee with a disallowed username prefix such as a- (temporary employees) and v- (contractors/vendors). Windows 7 pre-beta build that fails such validation will have the new user interface stopped, although they’re already incorporated into the build. Windows 7 Explorer and shell components do not initialize the check for validity at start. Instead, the system checks for variable with a cached value, which is the result done by previous check, is been read before performing any checks again. The memory space for the variable is allocated in the image’s initialized data section (.data). Hacker exploits this behavior by setting the initialized value in the image itself to 1 vice 0 to bypass all twelve checks, effectively enable all locked or protected features in Windows 7 pre-beta build. The tool to unlock the most protected and locked features has been released for free download by the hacker, and the utility is called “Blue Badge” tool. The tool is a new replacement for an older more complex manual process involves unlockProtectedFeatures.exe for achieving the same goal. If you’re surprise why it’s “Blue Badge”, it’s ‘possiblly’ actually referred to name tag for Microsoft employees, which printed with the photo and employee ID. If the background color of the badge is blue, it represents he or she is full-time employee (FTE), while green background is for v- (contractors/vendors). The revision 2 of Blue Badge Tool now will automatically backup the patched system files to another copy with .original extension. So no prior backup required. The new version of Blue Badge Tool also automatically support and compatible with Windows 7 system that has been patched before. Unpack and extract the ZIP file to get BlueBadge.exe file to the Desktop. 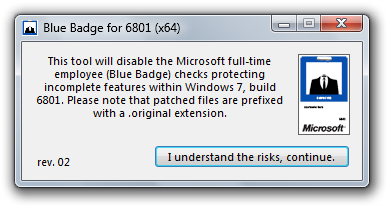 Then run the BlueBadge.exe, confirm the UAC elevation request prompt, and click on “I understand the risks, continue” button. Once done patching, click on “OK” button, and restart the computer to apply the changes and make the changes effective. Note that the tool is not endorsed nor supported by Microsoft. Beside, the features that been unlocked and enabled in Windows 7 pre-beta M3 build may not be the final representation of the functionality that will include in final RTM or even official beta version of Windows 7. However, it’s still useful for some eager Windows enthusiasts to experience and get a hands-on on new Windows 7 user interface that up until now still not accessible through pre-beta release.